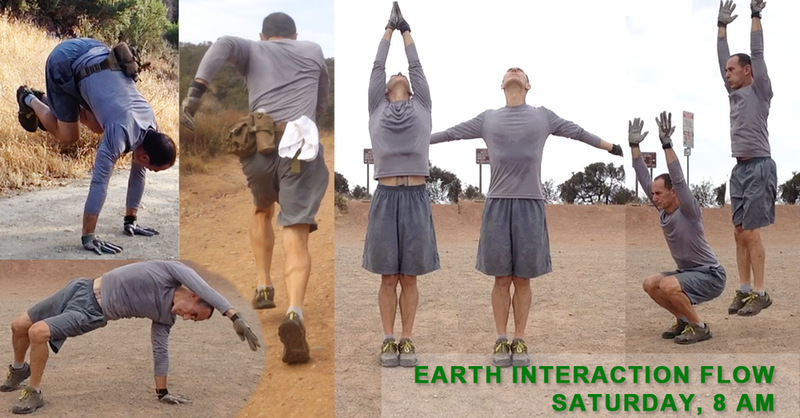 Earth Interaction Flow is a multi-disciplinary practice that builds on the sports science principle of "Ground Reaction Force" and integrates elements of Hiking, Trail Running, Mindfulness Meditation, Yoga, Tai Chi, Animal Flow, Sprint Plyometrics and various athletic training modalities. Interaction with the Earth in a natural environment conducts the power of the ground throughout the kinetic chains of the body stimulating and freeing the entire being including the muscles, joints, nervous system, cardiovascular system, respiratory system. The spirit is enhanced with deep connectivity to the Earth and the mind is balanced, relaxed and healed. This practice is all you need to overcome any physical, mental or emotional or spiritual condition. This is dynamic healing conducting the power of the Earth into your total being. The practice is available to anyone at almost any level of fitness. Play with it at your own level, from simple mindful walking to athletic trail running. Helping others along is part of the practice. We will be there for you if you need help. Appreciate natural beauty. Flow like water. Breathe the air. Allow the natural forces surrounding you to energize and balance you. A good sports shoe or preferably a low cut hiking shoe is required. We also want to get our hands on the earth so a sturdy pair of sports gloves is highly recommended. A pack that straps firmly to the waist or back to carry water is also highly recommended. Caballero Canyon offers a variety of trails from easy to challenging. We'll select the trail based on the group that shows up on any given day. It's a beautiful spot and there is a good amount of shade on most of the trails. At the top there is an amazing 360 degree panoramic view. Meet at the trailhead on Reseda Blvd. at 8 AM. We flow down the trail at 8:15 sharp. Up and back on the easy trail is about 2.5 miles round trip. It can take anywhere from 75 to 120 minutes depending on how many breaks and the speed of the group. Currently the session is free but donations are graciously accepted. Private instruction is available on request.